The Teenage Mutant Ninja Turtles Pizza Cookbook is available now. Fans of the ‘heroes in a half shell’ connect pizza to the Ninja Turtles franchise in an instant. Now, with 65 pizza pie recipes they’ll be able to dine like Leonardo and the gang. 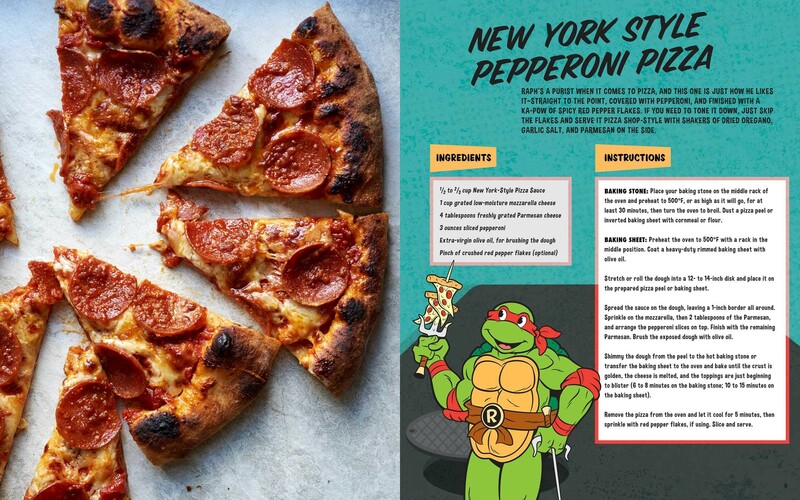 The Teenage Mutant Ninja Turtles Pizza Cookbook is exactly what it sounds like. Published by Insight Editions, it groups together recipes for loads of different kinds of pizza, accompanied by photographs and graphics of the Turtles. There’s something for everyone: classic styles to fancier options. The layout is incredibly appealing, so even if you’re not a kitchen-enthusiast, you might want this on your coffee table. From the New York Style Pepperoni to newfangled feasts such as the Lean, Mean, and Green and Shredder’s Revenge. There’s a pizza for every occasion — breakfast pizzas, mini-pizzas, party pizzas, and even dessert pizzas. So get on the ninja diet and be prepared to eat your hearts out! Cowabunga!